What is GTO looking in the Group Planning Exercise ? What is GTO looking in the Group Planning Exercise? 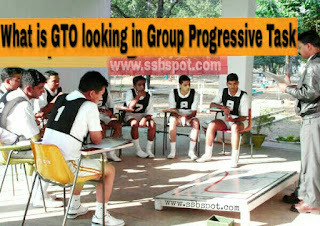 Group Planning Exercise (GPE) or sometimes called as Military Planning Exercise is the part of GTO task of your SSB interview. Group planning exercise (GPE) is a fun task to do, you need better thinking and fast mind, all you need to do is come out with the best plan to reach your goal. This task has a model placed on the ground, it consists of certain problems which are given to you. Have the aspirants been able to get a clear idea of the overall situation? Have the aspirants been able to process and seek the problem in detail? Have the aspirants been able to divide the work properly among his teammates? Have the aspirants been able to sketch the problems in the right way possible or able to arrange in order of priority? Have the aspirants been able to overcome the problems in a proper organised way ? Have the aspirants been able to put across his ideas in the right effective way in the group discussion? Were the Aspirants open to accept others idea or not ? How were the aspirants approach towards reaching the final outcome? What is Group Planning Exercise ( GPE ) ?